I have been doing a lot of scripting and voiceover recently for a series of 10 e-learning modules on Professional Selling skills that we have been developing with Bill Gibson of Knowledge Brokers International (KBI). It’s called the Complete Sales Action System or CSAS, and is being rolled out in of the major banks in SA initially as blended learning, but it is also for other KBI clients, and the wider local and international market. It is a major project with potentially 24 or more modules in all. The content has been great to work with – Bill provided us with loads of content including notes to the courses, examples for the students to do, and even videos of Bill addressing classes on each topic, so we could understand the context in each case. We could also use the notes as a good basis for the script, making them more chatty and interactive, adding summaries, the examples, and guides for the students, and finally adding quizzes for online assessment. As a result, converting each module to an online script took only a couple of days, because the content was so well laid out initially. Lesson number 1 for content providers therefore – if at all possible, make sure there is good text- based or recorded content from which script writers can work directly – and that if there are a number of modules to develop, that there is consistency in the quality of the information provided. This not only cuts down the time and cost of e–learning development, but it also frees up the script-writer to develop a really good and engaging script for development. This is pretty obvious, but on the whole most material e-learning developers receive is really not great at all. Sometimes it is just a Powerpoint and some notes, or a workbook which does not link to anything. We are not alone in this – this is a pretty general complaint in the e-learning industry. The next point is a bit more subtle. 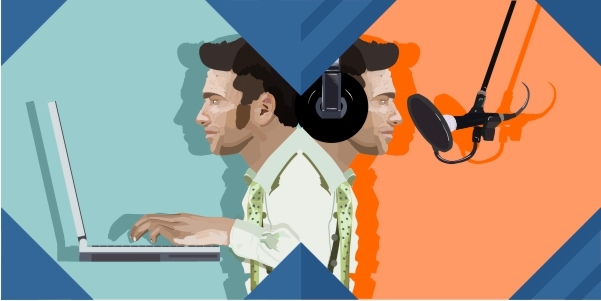 Because we have both script-writing and voice recording capabilities inhouse, and don’t have to outsource the voice recording to outside artists, we can do what I would call “write for the voice”. In my case, this is even better, because I am fortunate enough to be able to combine both the scriptwriter and the voice roles. As a result, I write for the way I think it will flow best, for the way it will read best, and for the way I speak normally. I can imagine reading it as I write, so as I script it I am thinking of phrases to use which will flow well when reading them back, and then I actually read the script out loud and edit it finally just before the recording. There is nothing wrong with separating the scripting from the voice, of course, and we have not been able to achieve this “personal” integration on every course we have developed. Sometimes one of us does the script or storyboard and another does the voice. And sometimes we outsource the voice. But overall, based on my most recent experience, I would recommend that the same person who writes it, records it. Particularly with a large project, and providing this is possible of course! I am not a developer – we have a team of professionals for that, but working closely as a team in one place also helps a lot. The development team takes the basic script and gets on with the design and development, all the characters we plan to use, the graphics, the menus and the total flow. But then there are always some later changes to the design for subtle voice changes, and to the script and voice for design ideas that the team have incorporated. This close-knit and interactive approach also means we can not only fine-tune and polish the final product before publishing it, but that we can also respond quickly to client changes on review – tweaking both the content and the voice in one go. That has particular benefits in terms of time and polishing the final product before it is launched to the students. We hope you found this blog interesting and that it generated some ideas.